Hebe ‘Arthur’ is a low-growing, evergreen shrub, reaching 8 in (20 mm) high, and more across in two years. The leaves are 0.4 in (10 mm) long, and 0.3 in (8 mm) wide, and are shiny green, with a yellow margin. The flowers are white, and are seen in April and May, and maybe again in August. A hebe hardy in the UK. 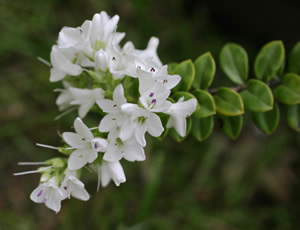 This hebe was collected by Kenneth Beckett on Mount Arthur, Nelson, South Island, New Zealand. One of the parents may be Hebe vernicosa.